The Digital Power Meter offers all the measurement capabilities required to monitor current, voltage, power range and four-quadrant metering in an electrical installation. Its main function is to measure various electrical energy values and power quality parameters, including power factory, harmonics, and current/voltage unbalance. Delta’s Power Meter can also identify equipment malfunctions, energy waste, and other power quality issues for purposes such as analyzing electricity consumption and managing energy usage. Features include highly precise measurement of bidirectional electrical energy and power parameters. It also provides simple installation and easy operation and a built-in RS-485 communication port that supports Modbus RTU/ASCII. All models comply with international installation dimensions and CE international safety approvals. 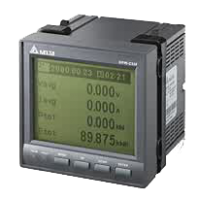 Delta’s Advanced Multifunction Meter DPM-C530 offers precise measurement of various electrical energy values and power quality parameters, including power factor, harmonics, and current / voltage unbalance, and it also provides off-limit alarms and history log functions.